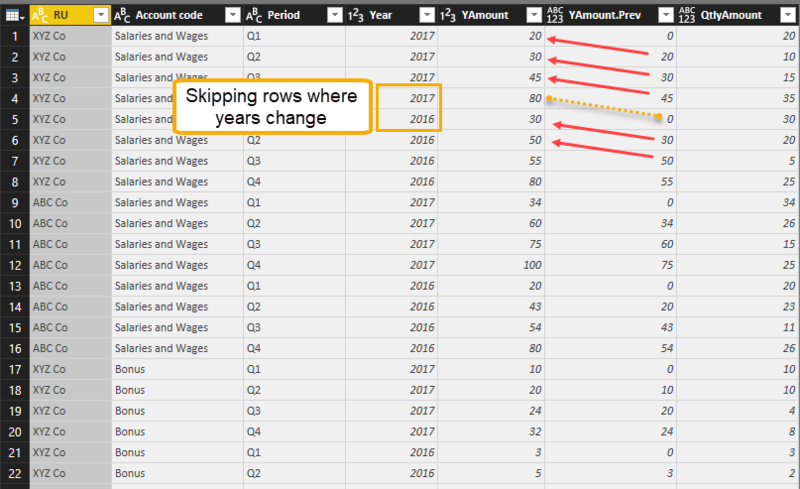 The M-function Text.BetweenDelimiters does what it says and returns the text between 2 delimiters in the query editor of Power BI and Power Query. But irrespective of its optional arguments you can use to select specific occurrences, it will always only return one string found. Meaning all strings found between the delimiters “+” and “!+”. Recently I picked up an interesting request to transform text with exceptions: Transform the words in a column to proper case, but keep certain keywords like in a defined list. So I proper case each word that is not contained in the “KeepTable”, identify the elements in the “KeepTable” in a case insensitive way and transform them into the syntax that’s specified in the “KeepTable”. It clearly is a removal operation and here I want to remove the 1st row from my table (“1”), and just one at a time. Also want to keep just one row (“A”) before the next one is removed (“2”) and so on. If you would have expected it to be translated to: Table.AlternateRows(Source,1,1,1) instead, you might have forgotten that the M-language in Power Query starts to count at 0, so the first row to remove is expressed by the 0 here. So if my input is a list instead of a table like below, I should expect a similar result than the sample above if I tweak the code a bit, shouldn’t I? But hey: What’s wrong here? Not a single element has been removed from the list !! So the order of the function parameters is different here. Also the other parameter names are different and their description. I find them much easier to understand in the Table function and of course, the function dialogue there helps to understand what shall happen as well. Lately I was working on a fairly advanced allocation algorithm on large data which forced me to search for different tricks to improve performance than those that you can find on my site here already. I was using List.Generate to check for every month in my table, if there was enough free capacity on a platform to start new wells. As every well had a certain production scheme (producing different amounts for a certain length of time), I first had to check the total production amount of active wells before I could determine the spare capacity for a new month. So I had to look into every active well, grab the capacity of the new month and add it up. Therefore I’ve stored the active production schemes in one table in my List.Generate-record. That lead to an exponentially decreasing performance unfortunately. Buffering my tables in the “next”-function reduced the query duration by almost 70% ! I also buffered a table that had just been referenced within the current record (and not recursively) and this improved performance as well. (Although in that case, the tables has been referenced multiple times within the current record). But this buffer didn’t have such a big impact on performance than the one on the table that was referenced by the recursive action. Is that new to you or have you made the same experience? Which grades of performance improvements did you achieve with this method? Please let me know in the comments!